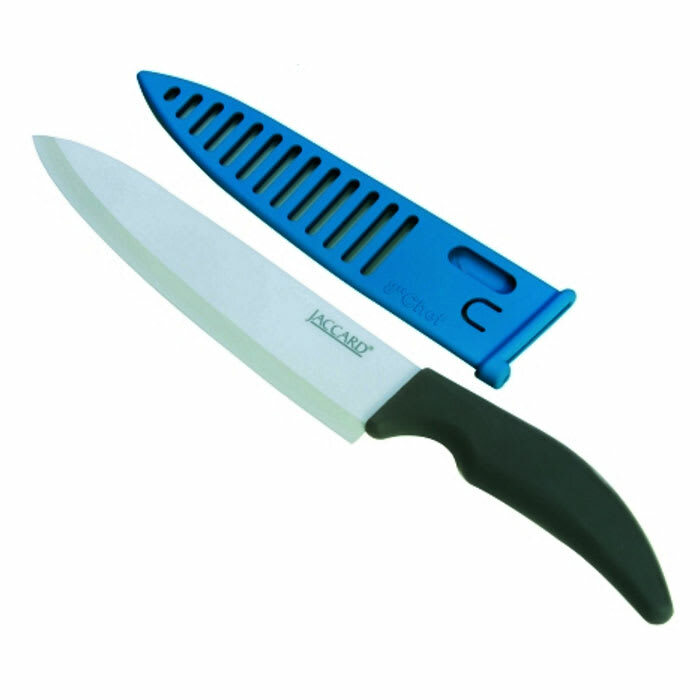 Effortlessly slice through vegetables, fruits, and soft boned meats with Jaccard's 8 " ceramic chef knife. This high performance, versatile knife's ergonomic soft grip handle is easy on your hands. Keep your lettuce from browning and your apples from losing their crisp color with its high performance ceramic blade that maintains its edge for 10 years. With its lightweight, balanced feel, and non-stick blade, you will quickly find yourself adding this chef knife to your kitchen arsenal. 8 in Ceramic Chef Knife, maintains edge up to 10 years, prevents browning of fruits and vegetables, lightweight, balanced, ergonomic soft grip handle, non-stick blade.